I really wasn’t sure if this was going to work. I’ve been wanting to try it for some time. I read on my friend Stephanie’s blog that she made it and it worked. I read her advice and tips and decided to go for the ‘overnight’ concept. Because I wanted it nice and warm in the morning for my boys! Didn’t burn on the edges. Was completely cooked in the middle. Turns out this was a huge hit…among all 5 boys. So much so that it’s going into the slow cooker again tonight. Right after a #BBQHacks Twitter party I’ll be cohosting! I dare ya to try it…might change your life. It just might. Generously spray a 5 or 6 quart slow cooker with non-stick cooking spray. Pour the mixture into the slow cooker. Set the slow cooker on low and cook for 5 hours. Keep warm until ready to serve. 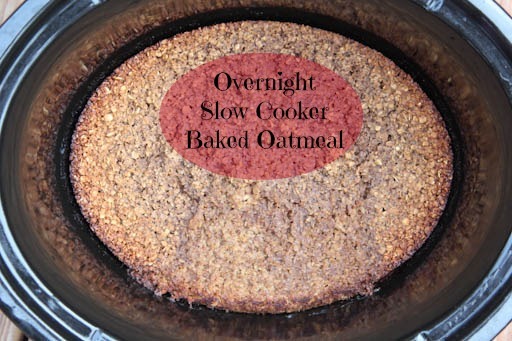 Serve Overnight Slow Cooker Baked Oatmeal with milk/cream/yogurt and fresh fruit. To Freeze: Let the oatmeal cool completely, cut into single serving sizes (I usually do squares), and freeze individual portions in plastic baggies. 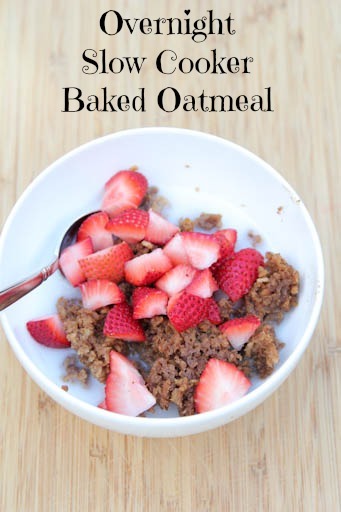 To Thaw: Drop the frozen oatmeal square into a bowl, and defrost it in the microwave for a minute, then warm it at regular temp for a minute, then add milk or yogurt and any other toppings and gobble it up! Do you think that would work in place of the quick oats with a little extra cook time, or soaking the oats in the milk first? I’ve tried several types of oats and the “best” for long cooking time is Irish steel cut, HOWEVER, as long as they are not instant they will work. I also chop an Apple or two and add along with nuts and raisins!! .This is great as you can keep in refrigerator and reheat any extra if you are single like me. Following! Same here, and I only have a conventional slow cooker with no timer. I too wanted to know if the slow cooker is to be set on low or warm the whole night? Thank you for the recipe. Hmmm, what if I put it on for 4 hours on low (mine will then automatically switch to warm)? I, too, have a simple crockpot. For recipes like this, my husband bought me what Lowe’s calls a “Utilitech 15-Amp Digital Residential Plug-In Countdown Lighting Timer” which can be set to turn off the outlet at a certain time (could also be used on lamp when we’re on vacation, for example).